Event Genius Pay provides an unrivalled platform of end-to-end solutions for any festival, arena, stadium, sports club, exhibition or conference looking to improve their fan experience, providing event organisers with meaningful data about their fans purchasing journey, from tickets, to tills and beyond. 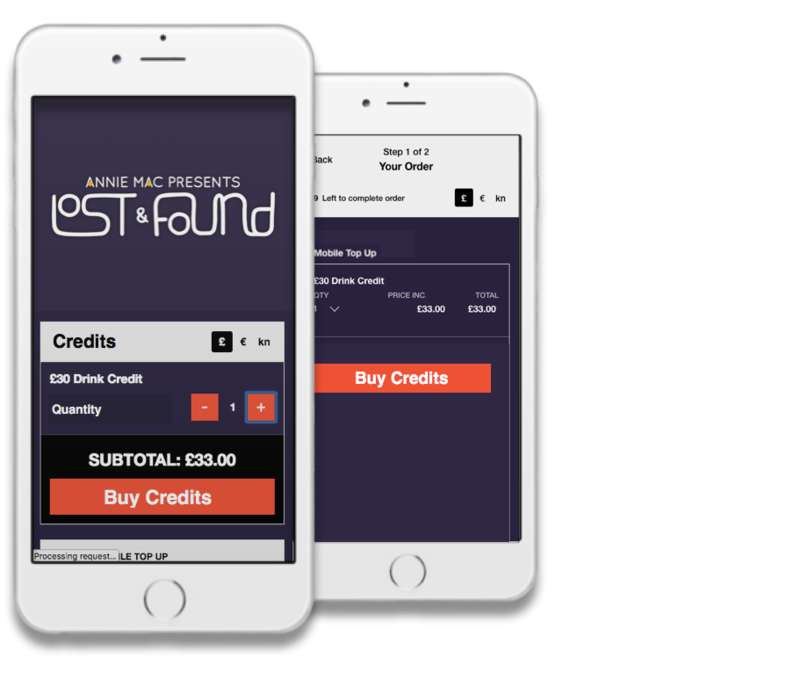 Reduce the number of suppliers you require, use our end-to-end solution to sell tickets, festival credits and more. Let fans buy credit in advance and make payments quickly with the tap of an RFID/NFC wristband or card. Manage access with ease. 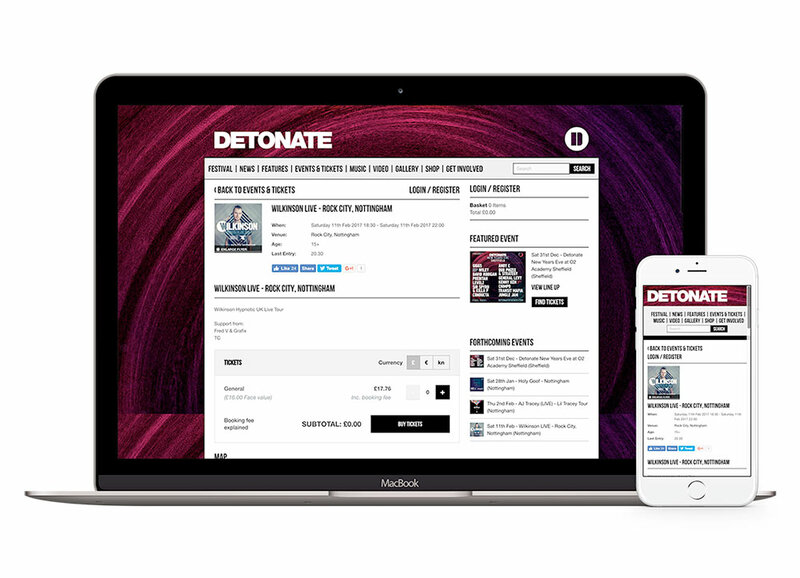 Authenticate tickets with a scan and manage admission with a tap of a wristband or card. Access a whole new level of data and insight at your event with our mobile-optimised dashboard. 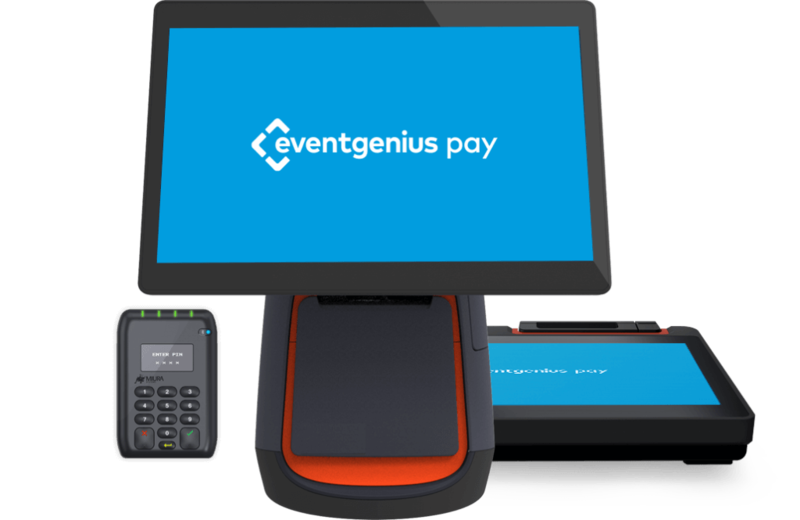 See up to a 25% increase in overall customer spend at your event by using Event Genius Pay. Generate extra revenue from the day you announce by selling credit vouchers in advance. Use precise vendor sales data to create better pricing models. Configure special offers and coupons to boost fan spending. Average order value of pre-purchased credit. Pre-purchased credit makes up an average 29% of overall event revenues. 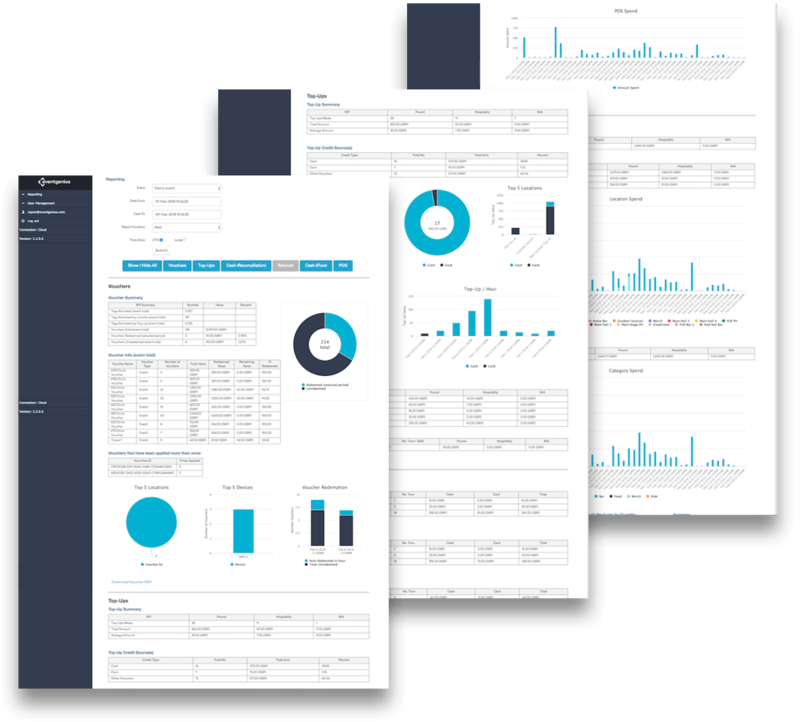 Our dashboards offer you a whole new level of rich data and insight. See which bars and vendors are the busiest, taking the most money and which products are selling out, then use this data to improve the planning of future events. Our reporting dashboard has been optimised for mobile devices and can be viewed during the event (network dependent) or will be provided as part of our post-event support. 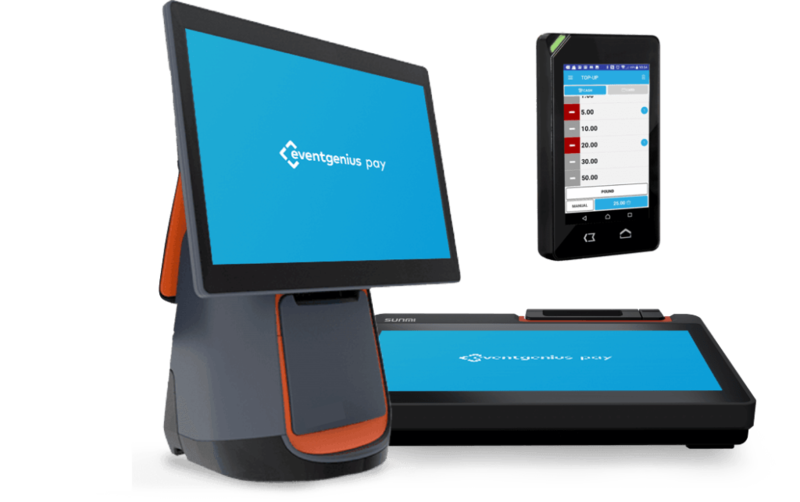 Quick to install at any event or venue, our POS devices are robust and have an intuitive interface that allows staff to be ready to serve within minutes. The hardware connects to most PDQ solutions and comes loaded with bespoke menus that itemise all food, drink, merchandise, concession and credit top-up options at your event. Generate early revenue, collect more data and reduce queues by allowing your fans to pre-purchase credit vouchers to spend at your event. Our data shows, when our white-label widget is utilised, pre-purchased credit vouchers generate an average of 29% of overall revenues and a 25% increase in spending per head. Mobile top-up makes it simple for customers to add credit to their wristband while on the go. 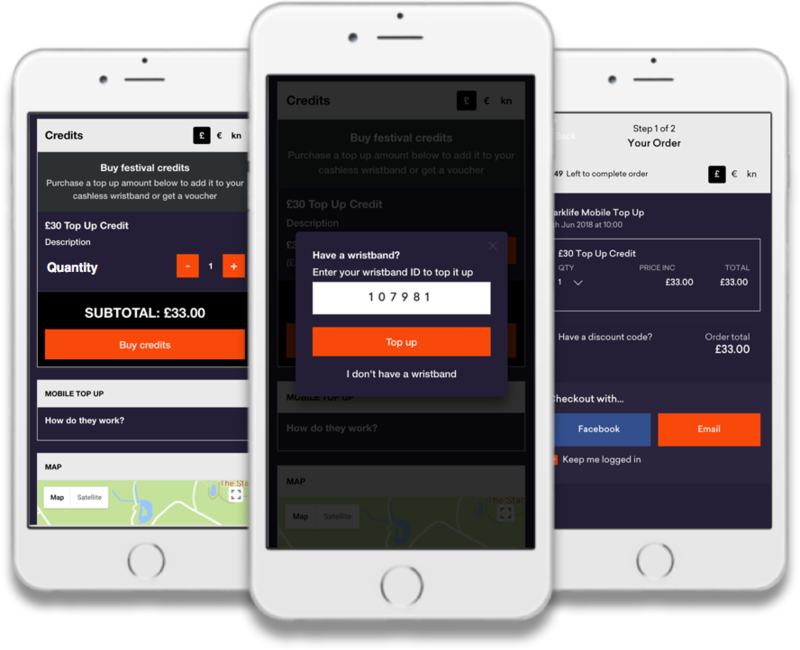 After purchasing credit using an app or via a white-label mobile website, customers can top-up with just a few clicks, by pairing the unique ID on their wristband to their purchase. 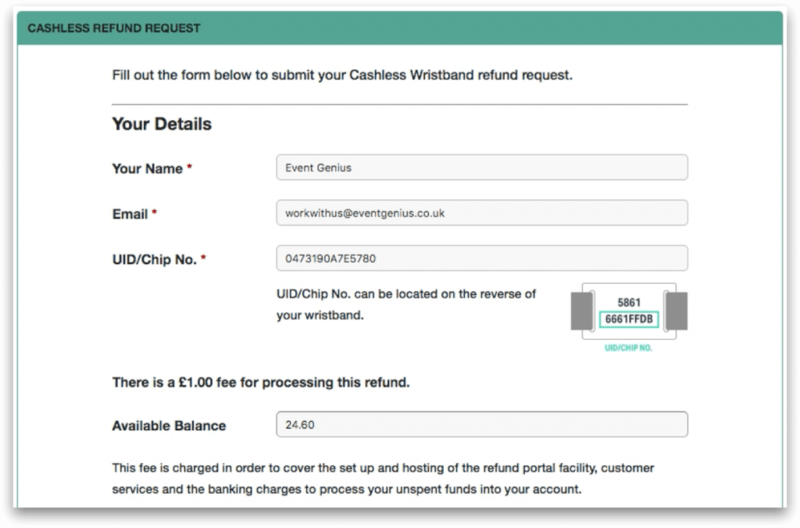 We make it possible for customers to add credit to their wristband even if they haven’t downloaded your festival app, have no available cellular network or have run out of battery on their mobile device. Working with your logistics team, we will install self-service/assisted top-up stations at the best possible locations, where staff can provide support to fans across multiple devices. 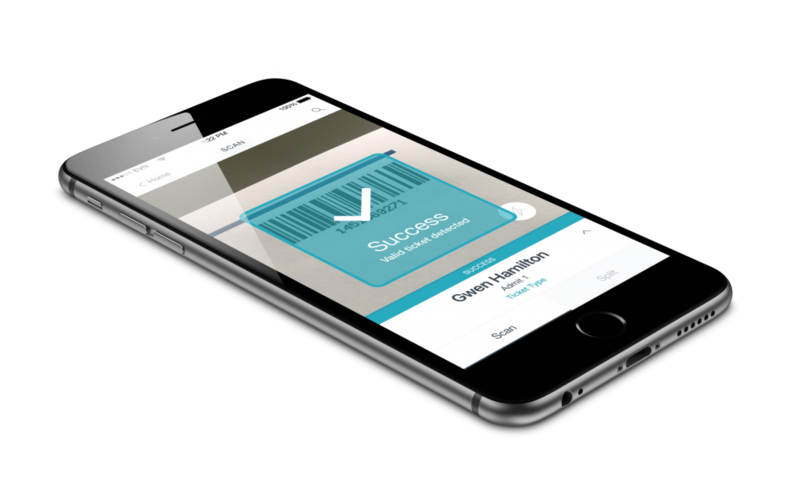 The Entry Genius app is free to download and acts as an advanced and robust access control system that significantly reduces entry queuing.  Its unique technology makes authenticating email, mobile, paper tickets, RFID/NFC cards and wristbands easy; automatically detecting fake or duplicate tickets. 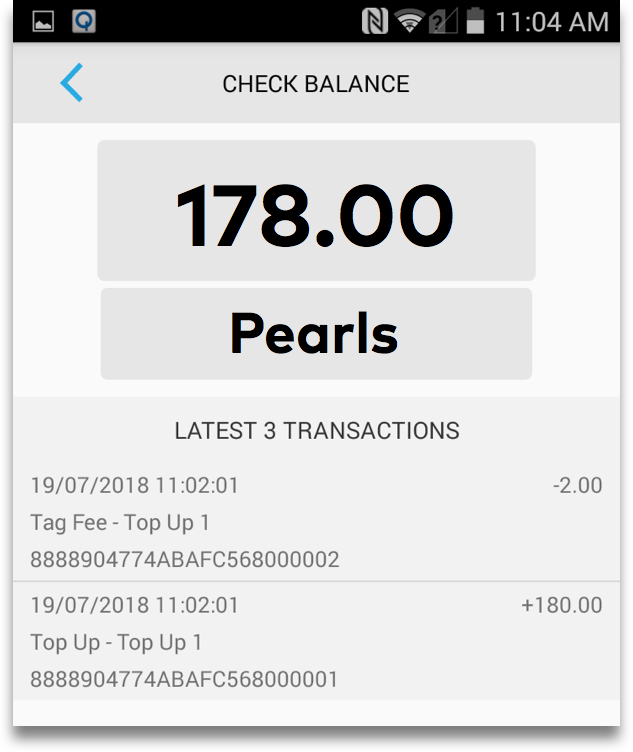 Our end-to-end platform can do more than just cashless payments. 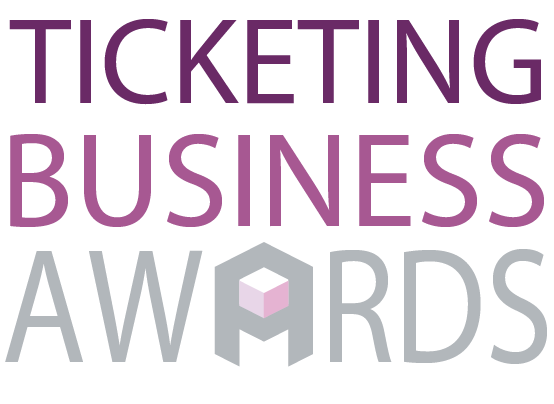 Using our white-label solutions you can sell tickets through your own website, at the door or even through reps, reducing the number of suppliers and integrations you require. Our platform is fully synced with advanced top-up purchases, allowing customers to purchase tickets and credit from one account, increasing conversion rates. Allow fans to purchase a branded currency that can be spent at your events. Create fixed exchange rates for the real-world currencies you choose to accept, simplifying pricing models and mitigating adverse market fluctuations. Use additional currency to manage and track your staff and artist spending, making reconciliation for your entire event a breeze. Make it easy for your customers to claim unspent credit with our onsite or online refund options. Whether you prefer to offer in-person refunds at your event, via a time-limited online refund portal or a mixture of the two, we can help. Recorded at the end of June, the footage shows the end-to-end ticketing, access control and cashless payment system in use for the second year running at El Dorado Festival. Building on the work we’ve done together at past festivals, this year the event organisers asked our team to deliver Event Genius Pay, our award-winning Cashless POS, across Malta. Our dedicated team was on hand at Forbidden Forest to deliver Event Genius Pay, our cashless POS solution, to festival fans and help organisers boost overall revenues. 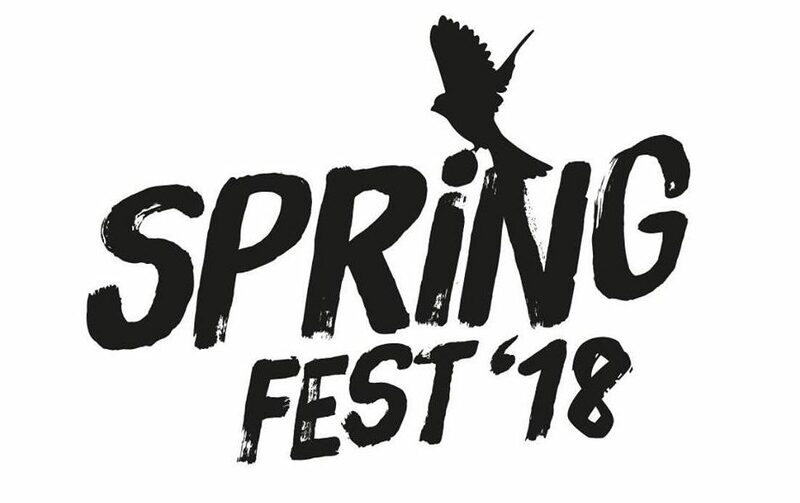 SpringFest used Event Genius Pay, our cashless POS, to improve their fans experience and increase customer spend at this year's indoor festival. Event Genius worked closely with us to successfully implement RFID during the build-up and throughout our event. They provided the best possible customer service and we would recommend their services. It was a big decision for us to go cashless in the festivals 1st year. We found the transition to RFID seamless and really saw the benefits. The event support team supplied by Event Genius were fantastic and ensured all bases were covered to guarantee the event ran smoothly.